Despite the rain, Miss 3 and I ventured to Splashland today to enjoy the inflatable water fun park set-up at Caulfield Racecouse. What better way to enjoy a hot summer's day than a splash about at Melbourne's very own pop-up water playground. I couldn't think of a better way of cooling down than throwing ourselves down a couple of giant waterslides. Unfortunately on the day we had booked it was pouring with rain, but, that wasn't going to dampen our spirits. Miss 3 loved the younger children's section. There are 3 attractions that are suitable for "toddlers" 3 to 5 year olds; a slide, a ninga course and a jumping castle. Older kids and adults are not permitted on these inflatables, they are for younger children only. This is great because there is no risk of little ones being accidently bowled over in the excitement. There is another section for 5 to 12 year olds, again adults are not permitted. Here there are two larger slides and a larger number of ninga assault courses. 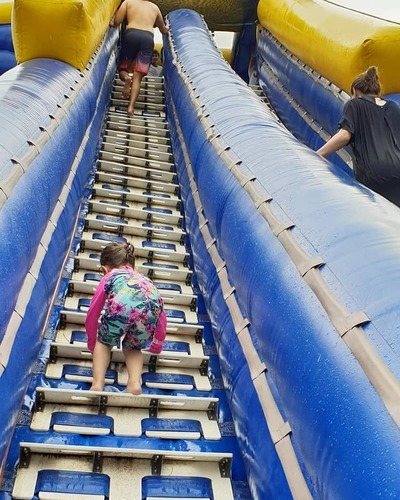 Two separate large slides are for adults and kids. Adults must go but on with a child younger than 5 years old. Bolder children can ride on their own. 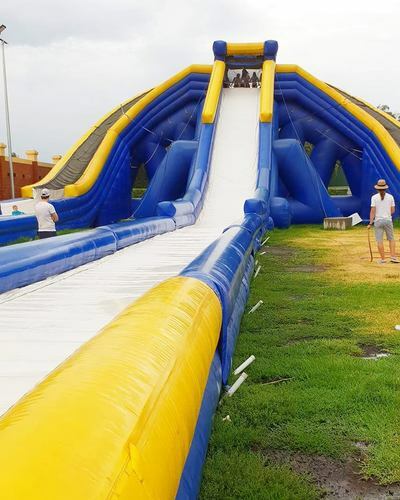 I must admit my favourite was the huge blue and yellow slide. Miss 3 and I claimed the steps all the way to the top - it's a long way up. At the top there are three slides to choose from; left, right or straight down the middle. I think the fastest was the middle one, which also happend to be Miss 3s favourite. Believe me, it is very fast. TIP: best not to go on with a two piece swimsuit to avoid any potential embarrassment! Although the sessions are for 3 hours after 2 hours Miss 3 did get a little cold. We had our own food and drinks with us, though decided to get some hot chips and hot chocolate to warm us up from the under cover cafe area. Children aged between 5 -12 are $29.50 each for a 3 hour session. 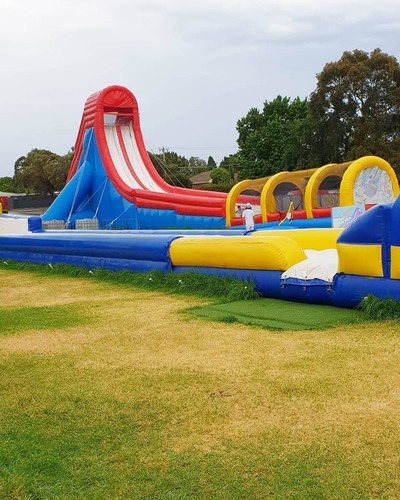 Another KidTown Tip: If you have a child aged between 3 and 5 and you don't wish to slide, your child can attend Splashland for $9 and you don't pay a cent. This is therefore excellent value for parents of preschoolers. If however you're a big kid like I am, pay $20 to go on the big slides with your little ones. They really are excellent fun. Splashland isn't suitable for children under 3 years old.